Snicker’s Story « Rescue K911 is an animal shelter located in Camp Hill, AL. The next day the vet gave us no hope that he would make it…Our life began to change the day we rounded a corner and in the middle of a rural country road, was one of the saddest sights we had ever seen. Lying in the road was what we thought was a puppy; nothing but a skeleton, sagging skin, almost completely bald with mange, covered with fleas and ticks. Without thought or hesitation we jumped from the car, reached out and scooped up this little guy, rushing him home to bathe, feed, and care for him. Little ‘Snickers’ was so weak upon giving him a bath that night, he collapsed in our arms. We didn’t even know if he would live through the night. The next day the vet gave us no hope that he would make it…he had been undernourished for so long that his vital organs had been compromised. He also said that our ‘puppy’ was almost a year old and had been starving for a long time. We are happy to say that little Snickers did make it, and was was with us for 10 wonderful years. Little did we know then that this was to be the beginning of our calling and our purpose in the years to come. The love Snickers gave us, would inspire us so, and open our eyes & hearts towards the plight of the abandoned & unwanted. Ever since that day, back in 1997, many hundreds of dogs (& yes some kitties too) have been rescued & found refuge at Rescue K911. Each one given another chance at life & love to find a forever family all their own. 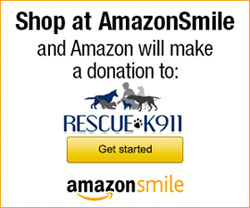 Now on any given day, Rescue K911 is home to over 100 dogs.